From Montpellier in Languedoc-Roussillon – there are good train links and a European Bike Express drop-off point in Montpellier – it's only a short ride to Arles via a crossing of the Carmargue, taking in Saint Gilles church with its fine carvings on the way. After battling your way west through Montpellier, climb across wild countryside until the river Hérault is crossed at St-Guilhem-le-Désert. The church here is pre-Romanesque and very fine. Ride through Lodève with its fortified cathedral and on to the picturesque town of Castres, founded around 800AD. Keep riding in a westerly direction to Toulouse, with its modern streets threatening to overwhelm the medieval quarter. For such a huge city, the pilgrim might be disappointed with the dearth of places of interest to enjoy. Following the river Garonne south-west, head for St-Gaudens in the Midi-Pyrénées and reach St-Bertrand-de Comminges, one of the high spots of this route. The cathedral is built overlooking a huge and largely unexcavated Roman city. The interior of the cathedral has an enormous jube and many treasures. A couple of kilometres away is the church of Saint-Just de Valcabrère, built out of the stones of the Roman city. Ride to the modern pilgrim city of Lourdes and on to Oloron Sainte-Marie in Aquitaine, before swinging south to Lescun and on to the Somport Pass. A few years ago this route had virtually disappeared as a pilgrim way, but the dedication and hard work of a few enthusiasts has resurrected it, and it's now becoming popular, especially with German, Austrian and Dutch pilgrims. 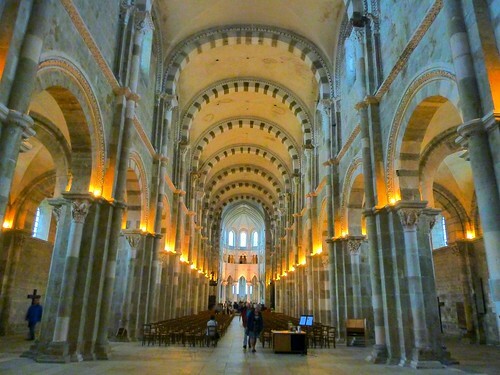 Vézelay, a lovely old town in Burgundy, was a pilgrim centre in itself for the bones of Mary Magdalene are said to be kept in the abbey there. 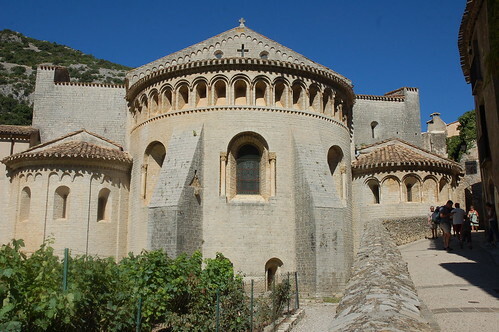 The tympanum is extremely fine, rivaling that at Conques. Signing is not always easy hereabouts, but once Nevers is seen on road signs, there are no problems. Accommodation is not too easy for pilgrims but the town and cathedral are rewarding. Cross the Loire and Allier rivers and steer for Neuvy-Saint-Sépulcre. Here stands a sepulcher almost a thousand years old and built to equal that in Jerusalem. The Creuse in Limousin is one of the most agriculture area of France, with endless fields of grazing cattle; it can be attractive if not overwhelming. Passing through Eguzon, La Souterraine with its stained glass of St Jacques, and Bénévent-l’Abbaye, one reaches Saint-Léonard-de-Noblat, a fine Romanesque church with some beautiful carving. Limoges should be visited but great care should be taken in traffic. Pass through Châlus with its donjon and head for Périgueux and Bergerac in Aquitaine. On arriving at Bazas, head for the cathedral and feast your eyes on its magnificence. Pass through the Béarn until the junction of paths on the outskirts of St Palais. Here take the D933 which will lead into Saint-Jean-Pied-de-Port. Stand at the foot of the Tour Saint-Jacques in Paris and you could believe that you were about to embark on the finest pilgrim route to Santiago. How wrong you would be. The truth is that there is really no appreciable way-marking on this route and ways which did join towns of importance have been hidden under major roads or even motorways. We do know, however, where the route went, so here is a list of the principal towns through which the route passed. It may be possible to figure out an alternative way. Paris, Orléans (Cathedral), Cléry-Saint-André, Tours (Cathedral), Châtellerault (Church), Poitiers (Cathedral and Sainte Radegonde), Saintes (Abbaye-aux-Dames), Blaye (Citadelle), Bordeaux (cathedral, museum), Saint-Paul-lès-Dax (church with bas relief). See our introduction to cycling the Way of St James, as well as The Way of St James: Le Puy en Velay to Conques, and The Way of St James: Conques to St-Jean-Pied-de-Port. John Higginson is the author of The Way of St James: A Cyclist's Guide. A keen cyclist in his youth, he took up cycling again after retiring from teaching. He is now a professional writer and lecturer. He is also the author of the Cicerone guides Cycling in the Loire: The Way of Saint Martin and The Danube Cycleway: Donaueschingen to Budapest. For the Way of St James guide, he and his wife Andrea spent two years researching the pilgrimage before embarking on their journey to Santiago de Compostela in 1997; they have spent much of their time riding alternative routes ever since. They live in France only a few kilometres from the pilgrim route and can often be found helping pilgrims in Cahors Cathedral during the spring and summer months.